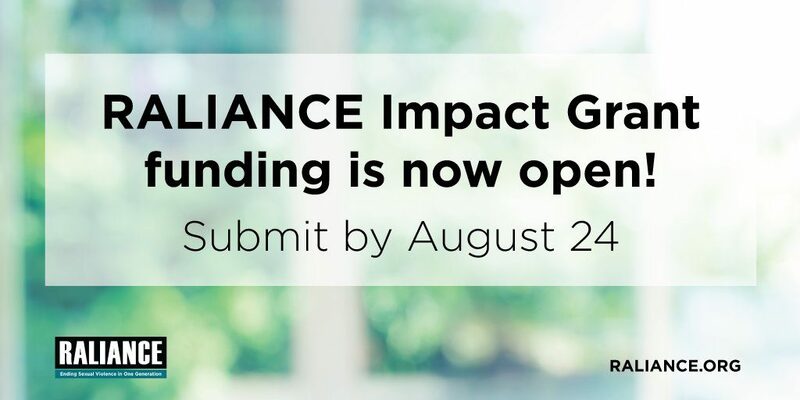 RALIANCE has funded 52 projects over the last 3 years as part of their Impact Grants Program and they have just announced a fourth year of funding. Funded projects will help build the evidence base for prevention, identify promising practices, and be replicable in other communities. Impact grants fund projects up to $50,000 over a one year period. This is a great opportunity to receive funding for sexual violence prevention efforts and advance the work to end sexual violence in one generation. Letters of Interest are due by 11:59 pm EST on August 24, 2018. For more information, including guidelines and FAQs, visit www.raliance.org. Coming soon: Learn more about what RALIANCE Impact Grantees have been doing in their communities to end sexual violence in one generation. PreventConnect and RALIANCE have teamed up to record podcasts with the grantees!